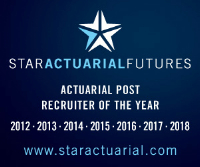 Leading private consultancy is seeking a part-qualified actuary (or CFA) to join its rapidly-expanding business where you will provide support on various investment consulting projects including establishing and maintaining asset-liability models, arranging fund manager selection exercises and quarterly reporting. In this exciting career-development opportunity, you will be named secondary contact for your clients and have the opportunity to attend and present at client meetings. Strong interpersonal skills are a must for this role, including excellent communication and IT skills (PFaroe/Excel in particular).